A serious contender for your subcompact .32 ACP firearms for those who want to carry them on an ankle, in a purse or in a pocket. 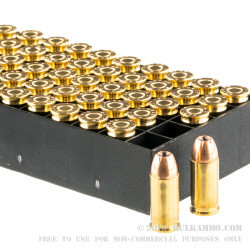 This is a faster moving, nicely appointed load that features a 60 grain projectile. 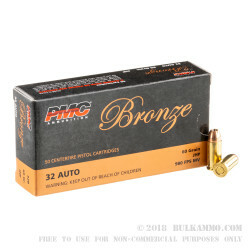 This is a 50 round box of PMC Bronze line ammunition which is perfect for the .32 ACP shooter that wants maximum impact on target from their tiny .32 ACP. 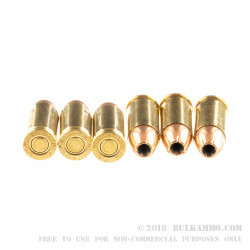 This is a 60 grain jacketed hollow point projectile that offers maximum benefit for this small caliber centerfire cartridge. The 980 feet per second velocity and the 117 ft. lbs. of energy out of the muzzle gives this 60 grain projectile considerable power in a personal defense scenario. Poongsan is a global company that offers munitions, metal manufacturing and is a massive producer of industrial parts and castings from bronze and copper as well as coin production. 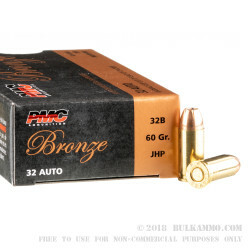 The company has been delivering on tough expectations in the American shooting market for decades through the PMC line of ammunition. The Bronze line is among their best all time sellers. This round features a Boxer primer which allows it to easily be reloaded with the proper tooling.